Steve Ragsdale CD and his lovely wife Christine made this years citywide contest a success. 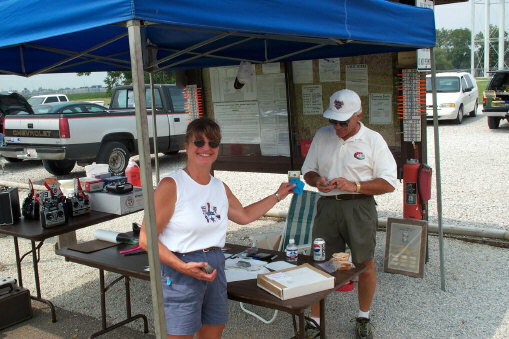 Steve and Christine have run many pattern meets for the club and they are always well organized and enjoyable. When Eric Hurst has time to forward the individual pilot names and scores, along with club standings they will be posted here. Stopped by Eric's screen printing business (Hurst Impressions) to get the results and he was busier than a one arm paper hanger. Eric is the one who prints all of the Screaming Eagles club shirts and hats. 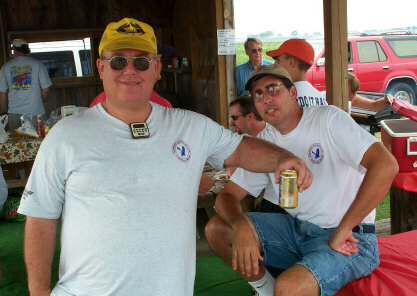 Bob Maxwell on the left and Eric Hurst on the right relaxing in the shelter. Bob runs the Boys School program for the kids and Eric has organized many club functions throughout the year including the preliminary organizing of this years Fun Fly.. Both of these guys are tireless instructors who are always willing to give the newcomer a helping hand. 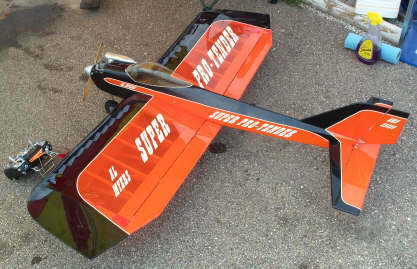 Al Meyers from the Chicago area flew his Super Pro-Tender in this years city wide contest. Al's airplanes are light and well constructed and fly extremely well. Dave Poland and his Pro-Tender. 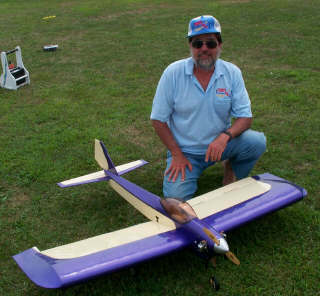 Dave made the trip from Monroe County to fly in this years fun fly. Dave does a lot of sport flying along with the occasional IMAC contest. Sure looks like Dave has a twin four cycle in this plane. The rains took over before I could see this plane fly in the second round. 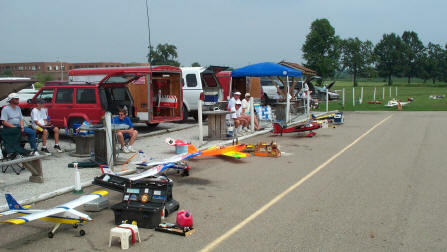 One half of the pit area at this years fun fly. There were many types of planes used for this event with some of the basic trainers doing quite well as long as the wind co operated.